What to make of the bizarre awarding of the Nobel Peace Prize to a president who had completed 0.82% of his term at the time the nominations were due? America, in the course of defending its own freedoms, has long extended to the likes of Norway, Denmark and Sweden a protective umbrella. Under that shelter, too many Europols have come to believe that peace is a function of nothing more than talk and hope and dreams and … premature prizes. Obama said on Friday morning that he will accept this award as “a call to action.” Action on whose behalf? 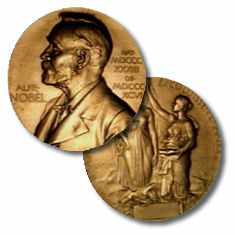 The five Norwegians who make up the Nobel peace prize committee chose to give him this award, for their own purposes. Obama, and America, owe them nothing. The real hope is that Obama will remember he took an oath (twice) not to serve as global spokesman for the Norwegian Nobel Committee, but “to preserve, protect and defend the Constitution of the United States.” Before his presidency is over, keeping faith with that oath may require him to do things [that] would knock the stuffing out of the featherbed philosophy of this sanctimonious crowd of Scandinavian free-riders. To pick a completely unhypothetical example, it may require him to send tens of thousands of additional troops to Afghanistan. At first blush, the Nobel Prize may seem to make it harder for an Obama administration to do anything involving a projection of American military power. But there’s another way of looking at it. While the prize is ridiculous, it’s not Obama’s fault that it was awarded. At the risk of indulging in wishful thinking, the prize may give him protective cover to act in the long-term interests of peace — even when it involves military action in the short run. If so, it would be part of the silver lining I’ve been monitoring since Election Day. This entry was posted in Uncategorized and tagged Nobel Prize, Obama Silver-Lining Watch, Obamessiah by Kirk Petersen. Bookmark the permalink.